I’ve been proudly involved with Neural Knitworks since its inception, sharing the latest article out on this fabulous activity that’s being taken up by young and old across Australia. Help us spread the word round the globe and set up your own local knit-in. What do knitting and neuroscience have in common? Most people would say not a lot – one activity involves yarn and knitting needles and the other studying the body’s nervous system. But research shows knitting and yarn craft, like other meditative activities, can “activate areas of the brain that are good for generating a sense of calm, (and contribute to) improved emotional processing and better decision making”. A recent study conducted out of Cardiff University in the United Kingdom also found knitting has significant psychological and social benefits. In a survey of 3,545 knitters worldwide, respondents who knitted for relaxation, stress relief and creativity reported higher cognitive functioning, improved social contact and communication with others. In short, knitting made them happier. And warmer – nothing beats the winter chills as well as a homemade jumper or scarf. Tapping into these findings is Neural Knitworks, a community engagement project first developed for National Science Week in 2014. 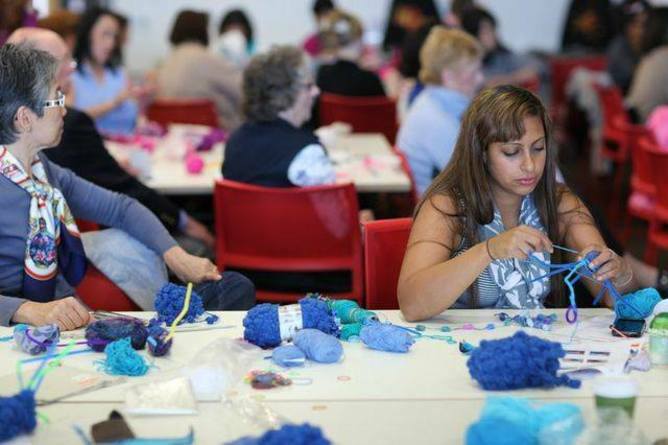 So successful has it proven that hundreds of knit-ins have been held across the country – in regional towns, remote Indigenous communities, libraries, galleries, schools, hospitals and at community centres – since. Knitting and neuroscience have more in common that you think. Workshops have been held for preschoolers, retirees and sufferers of dementia and depression. Participants have included students, library and mental health service patrons, university staff and scientists, with expert guests ranging from dementia carers and mental health workers to neuroscientists and university researchers. At a recent knit-in held at Redfern Community Centre, former Sydney Rooster Ian Roberts spoke about a career of sustaining concussions in football, with fans making footy neurons in team colours to raise awareness of brain injury in sport. Other speakers have discussed the effect of mindfulness activities such as yoga, meditation and knitting on brain health. In a neat quirk, knitting first-timers create woollen neurons in their hands at the same time as they forge new neural pathways in their brains. That’s what acquiring a new skill does; enhancing brain health in the process. At the end of each knit-in, individual neurons are gathered together and displayed in a network. The first major show held at Hazelhurst Regional Gallery during National Science Week 2014 featured a giant, walk in brain sculpture made from more than 1600 knitted, crocheted and woven brain cells donated from crafters all over Australia. Neural Knitworks was founded by Pat Pillai and Rita Pearce, who developed the idea into a National Science Week community engagement initiative with the support of Hazelhurst Regional Gallery and Arts Centre and Inspiring Australia. With the help of neuroscientists Sarah McKay and Heather Main, and science communicator Jenny Whiting, the pair developed scientifically informed patterns. These patterns reflect what a neuron looks like when it’s placed under a microscope – complete with dendrites, a nucleus, axons and synapses. As makers create these wollen objects, they come to understand just how complex the human nervous system is. 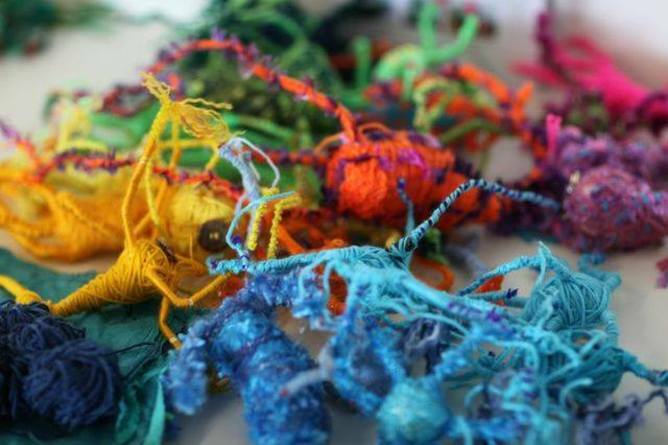 The human brain is thought to contain 80 billion neurons, give or take a few billion, so when we talk about mind health, a project like Neural Knitworks shows in simple terms just how large, sophisticated and fragile the nervous system is. It’s learning that starts with the basic building blocks of the mind. The first Neural Knitworks exhibition at Hazelhurst Regional Gallery and Arts Centre was seen by thousands of visitors over a three-week period. High profile supporters included brain surgeon Dr Charlie Teo, who held a knit-in at Canberra hospital, and Todd Sampson and Dr Karl, who each tweeted images of themselves holding colourful textile neurons. Hundreds of neurons recently adorned the library at Queensland University of Technology too, and Neural Knitworks has also been part of National Science Week events in Albury and Sydney. Last month, the National Museum of Australia ran knit-ins to launch Dementia Awareness Month and last week the Caringbah Lions Club Nifty Knitters held a knitted brain challenge. The range of mind health issues that can be explored at knit-ins is exceptionally broad, from ageing and addiction through to dementia, brain injury, depression and more. Even without an expert on hand, neuron crafters can listen to a mind health podcast as they create, or just enjoy the mindfulness that comes with yarn craft – in particular through expressing creativity and by learning something new while being with others. Participating in Neural Knitworks is a great way for people of all ages to learn about the billions of neurons in our bodies that save memories, send electrical signals to every muscle and receive signals from every sense. The artists acknowledge inspiration derived from Knit a Neuron UK, Sydney Hyperbolic Reef Project, Wrap with Love Inc, Pistil – X Chromosome and the mentorship of Hiromi Tango as part of the 2013 collaborative project Hiromi Hotel: Moon Jellies. ← Nurture your mind and it will nurture your body.